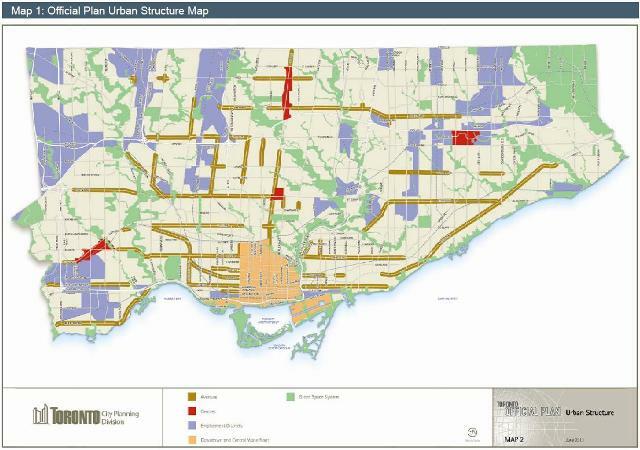 The October 22 meeting of Toronto’s Planning & Growth Management Committee saw the launch of the 2013 edition of a report tracking residential and commercial development patterns in the city. If anyone needs proof that downtown is the focus of development in Toronto, they need only look at the numbers in this report. Development in the Greater Toronto Area is strong, but Toronto itself is taking a larger proportion of the total. 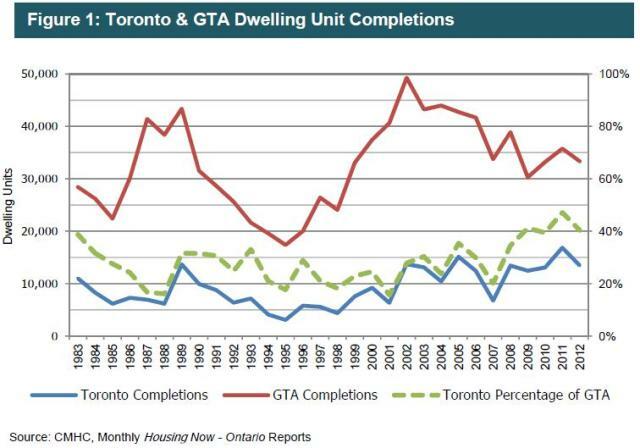 Across the GTA, dwelling unit completions have been on a long decline since a peak in 2002 while completions within Toronto have grown. 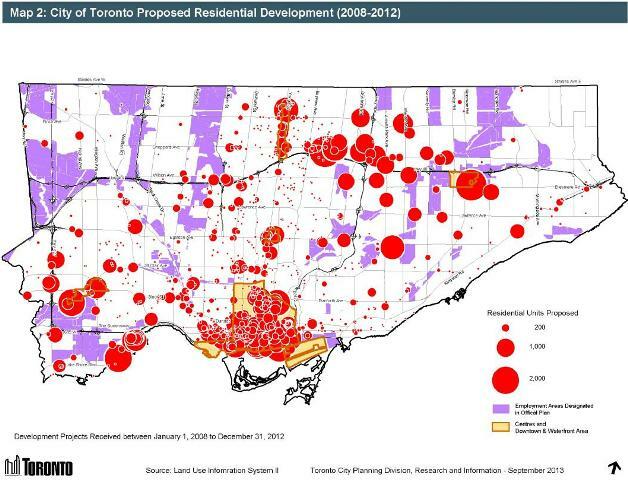 Toronto’s proportion of the total rises as a result with over 40% now located inside the City. City Planning tracks development applications within a five-year “pipeline” which allows for the long lead times between initial applications, approval, construction and occupancy of buildings. 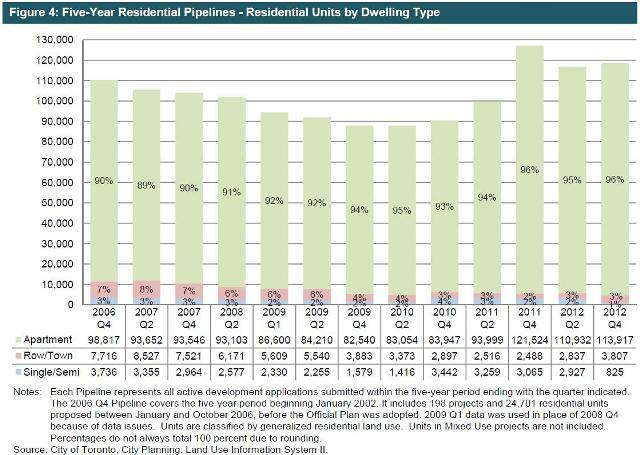 This smooths out year-over-year variations, but also flags a turndown in future growth if the early stages of that pipeline start to dry up. There is little sign of this happening up to the 2012 data, although the proportion of applications relative to the total rose slightly. The overwhelming type of new residential development is in the apartment form (this includes condo and rental projects). This is not surprising considering that there is almost no vacant land in the city suitable for low-rise development on the scale we see in greenfield subdivisions outside of Toronto. New development is not evenly distributed across the city, but is concentrated in a few locations, notably downtown. 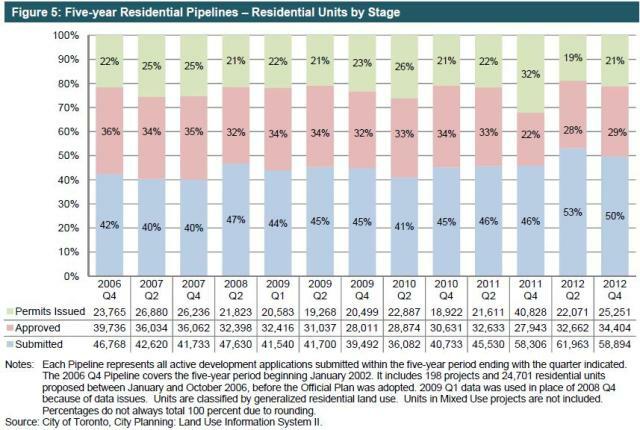 During the five-year period 2008-2012, 41% of the proposed residential units were downtown. This shows very strong market demand to live close to the core, but a related number is the 39% of proposed non-residential floorspace (GFA in the chart above) that is downtown. Downtown commercial development in Toronto is, today, 25% of all such development in Canada. Although City Planning puts a brave face on things, Table 3 also reveals the comparative failure of the “Centres” as planning mechanisms to focus development. Only 8.7% of all residential and 3.5% of non-residential proposals are in the four centres: Etobicoke, North York, Scarborough and Yonge/Eglinton. Scarborough Centre has almost no development planned at all. The data presentation caused some confusion at the P&GM meeting when North York Councillor Filion compared the “38%” number for his centre with the numbers for downtown. He was gently reminded that this was 38% of the 8.7% for all of the centres combined. Where data consolidation does mask important details is in The Avenues, those major streets that are targets for future development, and in the “Other” category. Almost one quarter of residential proposals are sited on The Avenues (the brown stripes in Map 1 below), but this is not broken down by city region. Some areas have a great deal of development proposed and already built (many of the early projects in the 2008-2012 pipeline are already substantially completed), while other areas have nothing. Are The Avenues actually directing development or simply endorsing what would happen naturally? 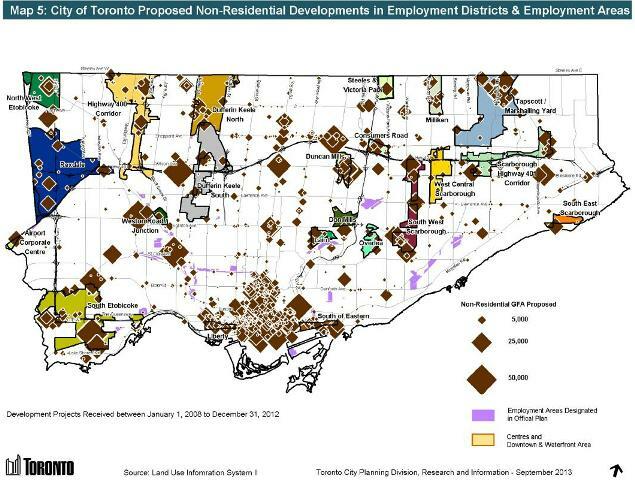 Almost 40% of non-residential development lies in “Other” areas many of which are designated employment zones. The actual development patterns are clear in the overview maps (for full size versions of all illustrations here, please download the source document from the City’s website linked above). The growth of downtown residential population is not tracked in this report, but a few comments at recent meetings give some indication of what is happening. Cllr. Vaughan spoke of the development pressures in the Entertainment District where the population has gone up 125% in the past four years. At a recent briefing on the Gardiner Expressway, Deputy City Manager John Livey noted that the population of Planning District 1 (downtown from roughly Dundas to Lake Ontario) has tripled between 2006 and 2011. With the developments in the pipeline, this pattern will continue. Non-residential space translates to jobs, and this puts great pressure on the transportation network. Some of these jobs will be taken by people who will walk, cycle or take surface transit to work, but many commuters will come from further afield via the subway and GO Transit. The idea that downtown “has enough subways”, to quote Mayor Ford, would be dubious with the existing level of demand, but seen in the context of future development the statement shows foolhardy disregard for investment in city infrastructure. 1. Directed the Chief Planner and Executive Director, City Planning to report on how to create a policy framework to cap growth in areas of hyper intensification and re-direct development in a strategic way to other parts of the city. 2. Requested the Chief Planner and Executive Director, City Planning in consultation with the General Manager of Economic Development and Culture, to report back to the Planning and Growth Management Committee on the methods the City of Toronto could employ to stimulate economic development in areas currently underused or vacant. In the case of downtown, there are areas where developments, many proposed at substantially above the zoned density for the land, are skewing the property market and straining services for current and future residents. In other parts of the city, notably Weston which is among the lowest income areas in Canada, there is plenty of land to develop, but no activity. How much power does the City actually have (or wish to exercise) in shaping its future growth? Major transit lines are planned or under construction, but it will be a decade before we see their effect. Meanwhile, large areas now served by subway lines see little development. How much of this is nimby-ism throttling growth and how much is simply market forces building where there is both a market and a profit? The disconnect between actual and proposed development, and the goals and dreams of the City Councillors and their neighbourhoods is quite striking. Without significant intervention by Council, a move that would be ideologically distasteful to many and certainly would be subject to legal challenges, controlling development, especially that which can occur “as of right”, will be very difficult. Should the transit system be built to serve what is there today and what we know will develop, or will Council persist in planning based on dreams that do not match market realities? These sorts of reports always make for a fascinating read because the charts and statistics tell a story that can’t be twisted by political rhetoric. This must be bad because it is downtown so the Planning and Growth Management Committee wants to re-direct development to other parts of the city. What the report doesn’t explicitly say but CAN be gleamed from looking at the raw data is: During the five-year period 2008-2012, 0% of the proposed residential units were at Scarborough Town Centre. So we need to build a subway to Scarborough Town Centre? Steve: And development will sprout from the ground just like it did at so many other locations. When data like this comes out I sometimes wonder whether the councillors are just being stupid and incompetent as usual or if the suburb councillors are actively trying to sabotage the downtown core. I think a lot of this stems from 2 things – Mike Harris unifying the city against its will, and Rob Ford deliberately setting neighbour against neighbour in order to gain votes. Toronto can’t do a whole lot about the former anymore, but I hope enough voters realise that the latter’s policies are ripping the city apart and have the wisdom to boot him out the next election. Graphs, charts, and data are too complicated and difficult for suburban councillors to understand themselves, much less to explain to their voting base. Graphs, charts, and data are especially despised by suburbanites as they don’t provide a simple answer that correlates to their pre-conceived biases. On the residential development map it is quite obvious that there is a high concentration of residential development on Sheppard Avenue East and Scarborough Centre. It looks like that is the largest concentration of condo development in the city outside of the downtown core; Yonge/Eglinton, the mouth of the Humber River and Kipling/Bloor also show up nicely on that map. Somehow looking at the map (and based on my personal observation of how much development there is in that area) I get the impression that the Sheppard subway extension is needed. Also there clearly isn’t very much development along the McCowan route where Karen Stintz wants to build a subway outside Scarborough Centre, so I suspect that doesn’t make sense, rebuilding the SRT as ICTS (much less expensive) is the best solution. The Sheppard subway extension route would be only 1km longer than the proposed SRT replacement subway and runs through areas with much more new condo development. Furthermore there obviously isn’t very much employment growth in North York Centre right now (unclear whether this will be true in the future or not), most of the employment growth outside downtown seems to be industrial and retail scattered all over the place. Obviously some sort of relief line for the Yonge line is needed, one of the big problems with the Sheppard subway right now is that the Yonge line south of Sheppard is absolutely packed, so the downtown relief line is really needed, and I think that the Sheppard subway would be a lot busier if the Yonge line were less overcrowded. If we built the Sheppard subway extension + a Don Mills subway line as far north as Sheppard, then this route ought to become the main way of getting from downtown to Scarborough Centre, while the SRT (which largely runs through low density areas) and the east end of the Bloor-Danforth line (runs through low density areas) would be less popular. With all the people moving to downtown, eventually they are going to have to change the boundaries of the wards (and provincial / federal ridings as well). It will eventually mean more urban / downtown wards and a smaller number of suburban wards within the city limits. Not that all of the wards/riding have the same number of people. So there might be tilt in favour towards the urban wards, but that is YEARS away. As for the development along the avenues, that is just going to increase demand for transit. It seems to be a mostly east west development, so there is going to have to be something done to get all those riders south or north. According to the Chief Planner recently, 80-something percent of Toronto’s growth has happened where the OP directed. The data tells a different story. Based on my experiences, Council has failed by playing politics with planning. Even if they had stuck to their own script, we’d still be in a mess without a proper transportation and infrastructure plan – evidenced at last Council meeting when it voted to impose on residents the continued subsidy of the wealthy development industry. How do you figure that? Two or three red dots does not equate to a lot of people and that is presuming Sheppard would actually be useful for them to go some place. You made the point yourself that there’s hardly any employment growth at NYC and without a major employment destination the Sheppard subway will always be empty. During the rush hours the Sheppard subway appears to be packed, but that appearance is deceptive. Unlike the other subway lines only 4-car trains are being used and only the bare minimum amount of service is being used. If they added just one 4 car-train during the rush hours, they could increase the capacity by 50% and crowding would no longer be an issue. That being said, according to this site due to various reasons surface LRT is restricted to 3 car trains and 4-5 minute headways. It appears to me that at least during rush hours the Sheppard subway is operating at/or above surface LRT capacity. Although the overall ridership does not remotely justify a subway extension I wonder whether or not the Sheppard LRT has the capacity to handle the ridership during peak hours up to 2031. Steve: Adding one 4-car train to Sheppard would increase the capacity by 25%, not by 50% as there are four trains on the line at all times. The round trip time is 22 minutes, and a 5-train service would provide a headway of 4’24”, still well above the 2′ minimum that the signal system supports. The design capacity of the service today is around 7,300/hr, but not all of it is used because of uneven car loading on trains, and uneven train loading over the peak hour. Some traffic on the subway transfers from routes that will still exist after a Sheppard LRT is built such as the Don Mills bus. The peak load on the subway will not all translate to peak load on the LRT, although the LRT will engender demand on its own by being out of the traffic snarl that affects bus services. The 3-car LRT train limit is based on a question of train length and hence platform size especially for street-level stations. One issue will be uneven car loading if passengers all funnel onto the platform at one end at every stop. Another issue is that the area a stop occupies must be fairly level, not on a grade or curve, and for some route segments this can be a challenge with longer trains. For service design purposes, the capacity of a new LRV is about 150 riders. More will fit, but service is not designed to operate at that level on a sustained basis. For the “super peak”, the period during which higher loads can be planned for, there is easily another 25% above that 150/car design capacity. This would typically be on the inner end of the line for a period of 30-45 minutes at the height of the rush hour. The projected peak demand for Sheppard is around 3,000/hr, or the equivalent of 20 cars/hour. If we run 3-car trains on a 5 minute headway, this gives us 36 cars/hour, and that’s a lot of room for growth. 5′ is not the absolute minimum headway, merely one desired by the traffic engineers to avoid too much interference by “transit priority” in the operation of conflicting traffic (left turns and cross-traffic at intersections). A new federal riding is being put downtown and it should be ready for 2015. Provincial and municipal ridings and wards are based on the federal ridings. Steve: Actually, municipal wards are not necessarily based on the ridings. The new map, however, has rekindled the debate about the size of Council and whether it should be expanded to 50 (based on 25 ridings in the revised “Toronto”) or 25. This won’t be decided by the current administration. Steve, what are your thoughts on additional grade-separated access points for in-street LRT stations as a way of flushing out passengers out of the island quicker? In my mind, the accessible crosswalk entry point would remain. Steve: First off, the cost of such accesses would be considerable as you would dig down into the layer where utilities live. Next there is a question of the extra time people would take to use stairs both ways (I presume you would not include escalators as those with accessibility needs would use the street crosswalk). Then there are the security and maintenance issues of such underpasses. Finally, the access points on the platforms would take up space and probably require them to be wider unless these came in at the “blind” end of the platform away from the intersection it served. My thoughts in brief: a total non-starter. The locations of new office space have changed dramatically over the years – there was a huge amount of office space in North York, in North York Centre and along the DVP/404 built in the 1980s, but not very much since then. In the 1990s and early 2000s we saw almost all new office space being built in the 905, in the last few years we have seen a lot of new office space being built downtown. Now there is an office building under construction at Yonge/Sheppard (part of a condo development) and one proposed at Yonge/York Mills, but employment growth in North York is still low. It is very uncertain what employment growth will look like in North York in the next few decades. Nevertheless, Sheppard Avenue between Allen and Kennedy appears to be the 2nd largest concentration of residential development in the city after downtown. Nearly all the new condos on Sheppard east of Don Mills were built after 2007 (when Transit City was proposed) so the Sheppard LRT ridership projection is likely outdated. The Sheppard subway is mostly being used by riders who transfer to the Yonge line to go downtown. The Yonge line south of Sheppard is severely overcrowded, so this must discourage people from using the Sheppard subway in rush hour. Obviously another major north south transit line is needed to relieve the Yonge line to deal with this problem. A lot of people who live near Sheppard/Don Mills and work downtown must be using the DVP, despite it being the worst congested of the major highways, rather the subway because the Yonge line is so over capacity. Sheppard East is obviously seeing much more residential development than most other parts of the city other than downtown. The east end of the Bloor-Danforth line is seeing far less development than Sheppard east of Don Mills even though the former has existed for almost 50 years and the subway along the latter was never built. Finch West is seeing very little development, and there is no condo development at all at any of the stations along the Spadina extension now under construction that are in Toronto city limits. It does not make sense to be building an area with a lot of 20 and 30 storey condo buildings and not build a subway, or in the case of the Humber Bay Shores area, add a GO stop and more frequent off peak service. The main reason for this is we are nearing the end of a prolonged real estate “bubble” that has been propped up by rich foreign investors buying luxury property. When it will end is another question. But for certain most young Canadian adults look at buying a home in a completely different light these days. All the core areas except Scarborough Center have a Subway to help sell the value of the area along with the “luxury” condo. I’m not saying an LRT wouldn’t help. But it’s hard to sell “luxury” to those that can afford to buy if it’s not the best. Steve: Your argument, if I follow it, is that we should build a subway so that foreign investors with no interest beyond having some place to park their money would buy condo units at some place like STC. In the process, they will probably artificially inflate the value of units to the detriment of “local” buyers. This does not strike me as a viable plan for rapid transit financing or urban development. Your argument, if I follow it, is that we should build a subway so that foreign investors with no interest beyond having some place to park their money would buy condo units at some place like STC. In the process, they will probably artificially inflate the value of units to the detriment of “local” buyers. This does not strike me as a viable plan for rapid transit financing or urban development. It doesn’t matter who owns the property. Areas with Subways will demand a higher purchasing & rental demand from even local Citizens. Nobody is catering to foreigners other than the banks for keep interest rates low and keeping the speculation going. Ok maybe the government as well since they don’t want our prized construction industry to come to a halt. But since foreigners & existing owners are the majority of buyers in the market they are looking for the highest demand areas. It just happens the majority of those City Centers that are still building are located near Subway lines. Majority Canadian ownership is all but a thing of the past. It is what it is. Just found it interesting how you mention there are no proposed Developments for Scarborough yet you seem to dismiss the attraction of the Subway. And again for the record. I would be happy to see only the BD line (or whatever they call it now) go direct to STC and have LRT’s/BRT’s(if necessary and if feasible) fill the rest of the Eastern City in the future. Otherwise just use buses for now. To integrate Scarborough Center with a separate form of transit from the other Centers of Toronto is not the right decision & no matter how strong you feel about LRT’s will never bring the quality of future development which is visibly being developed in the other areas of the City that “have”. This imbalance coupled with broken promises has already stunted the growth in Scarborough severely. Unfortunately it’s going to cost money to start shifting the balance & begin to fix this issue. Just found it interesting how you mention there are no proposed Developments for Scarborough yet you seem to dismiss the attraction of the Subway. You may want to look up ‘Edge Cities’ under Wikipedia to get a sense of why the city Centres concept has failed in Toronto. In particular, pay attention to the sections labelled ‘History’ and ‘Future’ to see how automobile-oriented and transit/pedestrian hostile they are. Scarborough Town Centre would have been the most successful of the City Centres in Toronto if there had been a Scarborough Expressway. But it is unlikely that building a Subway to STC is going to rejuvenate the area because it was so poorly planned and auto-centric to begin with. Developers have moved on and are looking to build Downtown and on selected Avenues such as Sheppard. Oh, and don’t forget the Edge Cities in the 905 area which will follow a similar evolutionary path to Scarborough Town Centre. Richmond Hill is already hoping that a Subway will solve their problems too. Steve: I’m not sure even a Scarborough Expressway would have saved STC. The Expressway was to follow the rail corridor parallel to Kingston Road. STC already has its expressway, the 401. The whole area is very pedestrian hostile, and the mall itself is not exactly neighbourly. If you go back far enough in time (1955) there were plans to have the expressway follow a more northerly route that would have passed close to the current site of Scarborough Town Centre. There were also plans to have an expressway running through the Gatineau hydro corridor and connecting to the DVP which would have provided a nearly direct highway link between STC and downtown Toronto. I guess the point here is that these city centres were initially designed to be placed at major road interchanges that were already existing or at least in the planning stages and virtually all access would be by automobile. Later, when the expansion of the City Expressway system was halted the priorities shifted to serving these areas by public transit. But the City centres and especially STC were already being designed and built around the car and extending the subway system isn’t going to change that. There is just too much wrong with the STC site to believe that a silver bullet such as a subway (pun intended) is going to revitalize STC and or any of the rest of Scarborough. Steve: Thanks for the link to that earlier plan. The corridor that version of the expressway would have taken was used by the subway from Victoria Park to Kennedy, and was originally proposed for the SLRT to STC. Objections from homeowners along the corridor killed off that alignment, but of course had there been an expressway, those homes would never have been built. By the time STC was on the drawing boards, the “Scarborough Expressway” had shifted south as a connection to the 401 out at the east end of the city. If you are in full denial that a Subway will not help rejuvenate STC more than any other form of transit you are basically being just as stubborn as Rob Ford. Just on the opposite end of the coin. I have no problem with LRT in the right areas or if that was the same technology North York & Etobicoke Centers were using. They are not and as a Scarboorugh resident the prosperity around the Subway line is glaring. I’m also a firm believer that when you build something right that people will want to be a part of it. And if you build something less than stellar then it leaves the same legacy. Where would DT be with the young subway line? Where would North York be without the stubway? You can pick all you want with ridership in North York but developers and foreign investors are still moving in. Or maybe you are right. Scarborough is hopeless. The soil is bad, the east gets worse weather, it smells worse and lets face it it’s hopeless to think people would want to move close to DT and have a short commute in the future. Steve: Get off it. Downtown was successful as the centre of Toronto long before there were any expressways or subways. However, it was not built with office towers and malls surrounded by parking lots and arterial roads that were uninviting to pedestrians. More recently, attempts were made to strangle downtown’s growth by building the Sheppard line instead of the DRL. It didn’t work because GO made up the difference. In any event, it was an already established core, not a bunch of fields with delusions of grandeur. I could just as easily say that you are in full denial that a subway won’t help STC, but that would be unkind. I never said that Scarborough is hopeless, simply that it will not sprout development at STC on the level subway advocates expect to see and use to justify their project. It will take at least ten years to find out which of us is right. By the way I really am getting tired of fixing your spelling. It’s “Scarborough” and “Yonge”. Damn Scarborough school systems! Not only do they teach about improper forms of transit implementation they don’t teach us to comprehend proper grammar. On a serious note once again I do appreciate you allowing my differing point of view on your blog. And just out of interest… Although it’s very early do you see any prospective Mayoral candidate opposing the Scarborough subway in the next election & if so don’t your think they would stand a chance against Rob ford or John Tory (if he runs). Steve: I suspect we will see everyone approach the subway as a “done deal” unless a revised cost estimate that is sky high comes out before the election. However, there will be support for LRT elsewhere, notably on Sheppard. That will be the key difference with Ford at least as far as Scarborough is concerned. I suspect we will see everyone approach the subway as a “done deal” unless a revised cost estimate that is sky high comes out before the election. However, there will be support for LRT elsewhere, notably on Sheppard. That will be the key difference with Ford at least as far as Scarborough is concerned. I fully agree. Aside from Ford there will be minimal support for a Sheppard subway. Some of the Scarborough Councillors who support the subway to STC would never support the Sheppard line. If the future plan is for a Subway to STC, a DRL and a Sheppard/Morningside/Eglinton LRT loop I think Scarborough would become a fairly attractive option for developers looking outside the downtown core. If you look at the Greater Golden Horseshoe and extract just the GTA, Toronto is supposed to get less than 20% of the population growth to 2031 – yet here we are getting over 40% of the housing starts!!!! The impact of the Greenbelt and the drying up of a pool of greenfield sites for sprawl was not really factored into the GGH – not that many people want condos in the 905, so the impact has been that population growth in the 416 is far higher than expected as the percentage/ratio of single family houses to condos declines. As for the Avenues, the unfortunate offshoot has been that areas like the Beach someone ended up getting lumped in with the wasteful low density suburban Avenues where most of the potential growth is… again, people buying condos want to be closer to Downtown, but the offshoot is that stable, pre-war mainstreets that were supposed to be the model for the suburbs are the ones getting a bunch of out of scale midrise condos that don’t fit being forced into communities that do not want them… like Ossington is also getting. It won’t matter if there’s a subway to STC and a LRT loop around the outside of Scarborough if demand isn’t there. There’s a reason why condos on Kingston Road overlooking the bluffs go for far lower prices than condos in the old city of Toronto. You can’t force private developers to build things that most people don’t want to buy. You mean the areas of Old Toronto that have had some form of TTC rail transit established for decades? Of course they will demand high prices and sales. Kingston Rd is another planning mess in itself. It really is sad to me that many of what should Toronto’s (Scarborough) tourist locations (Guild, Bluffs, Rouge) are so painfully accessed by transit riders and so lightly advertised as places of interest. I’ve seen the chart before, but not the maps accompanying it. Looking at the map, it seems a little dishonest to say that Scarborough Centre has almost zero development occurring. Perhaps directly within it, but adjacent to its east border according to the map about 3000 residential units and 25,000m2 of non-residential is to be built. Before I saw this map, I did see one argument for the subway: that it would help to spur development at Scarborough Centre. YES I KNOW THAT SUBWAYS ARE NOT ALWAYS PIONEERS TO DEVELOPMENT, but this would be slightly different than what occurred along the Bloor-Danforth line. This line would go directly into a growth centre, directly linking it with downtown. Also politics have opened up to urban renewal again, though this time in the form of condos rather than Corbusier style towers in the park. Seeing this map shows that this is not necessarily the case. The biggest problem about the SRT is not the technology used or the poorly designed transfers. Its biggest problem is urban planning surrounding it. In this case, imagine if Progress was an urban avenue rather than an industrial collector road. Perhaps to the west and east ends of Scarborough Centre it could have more light industrial added into the mix of uses, but nothing like the waste transfer facility which stinks up Midland station to high hell! Meanwhile Scarborough Centre itself, at worst could look like the proposed Mississauga Centre plan with the mall or at best like Markham Centre without it. Steve: My point was that in the “official” centres, only a small proportion of the total development was planned, and this if anything shows the folly of trying to identify such centres without planning controls to force development to match them. The fact that much of STC is private land means that a condo or office developer would have to haggle with the owners of that property rather than making their own land assembly elsewhere. If STC were publicly owned property, then it could be planned and developed to support the rapid transit line. It isn’t, and so it doesn’t. There is a similar situation in Etobicoke where despite making the Six Points the “centre”, the developers said “no, we prefer Islington” and that’s where the buildings went up. At long last, we might see the Six Points reconfiguration and some development where the plan said it “should” go. Meanwhile, years ago the TTC gave up land for a western subway yard that would have been a significant benefit to the network for a dream of “downtown Etobicoke” that never materialized.